How did Bush and Baker contribute to the end of the Cold War? The Cold War — a period of hostility between the U.S. and the Soviet Union — dominated global politics during the second half of the 20th century. Though the two superpowers never engaged in outright war, tensions were high and both nations amassed dangerous stockpiles of nuclear weapons. The threat of a third World War loomed. James Baker was just a teenager when World War ll ended and the Cold War began. Forty years later, when Baker was sworn in as the secretary of state, forces were aligning for the Cold War to come to an end. In 1988, Mikhail Gorbachev, the Soviet General Secretary, was deep in a campaign to reform communism. The following year, East German authorities opened up the Berlin Wall, which had long served as a barrier between Eastern Bloc residents and the West. 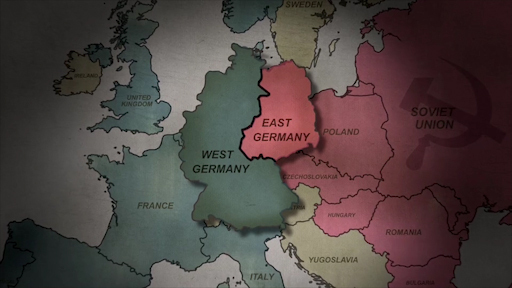 East and West Germany, which had been separated into two separate nations following World War II, were poised to reunite and join NATO as a unified Germany. With this reunification, the Cold War began to melt away. In this activity, students use a variety of print, non-print, primary and secondary sources to explore the social, political and economic factors that contributed to the end of the Cold War. They also evaluate the role that James Baker played in the political factors that caused the end of the Cold War.